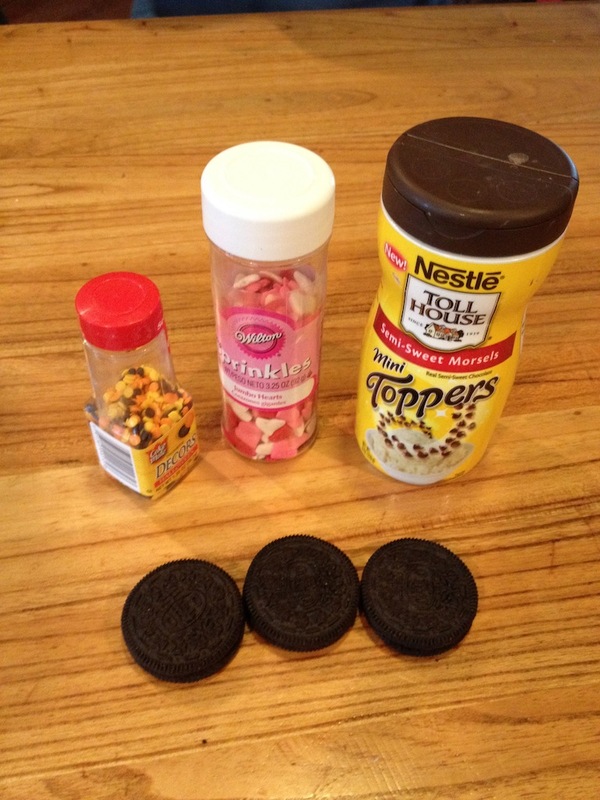 follow me home: Day 14 of Forty: Happy Birthday, Oreo! 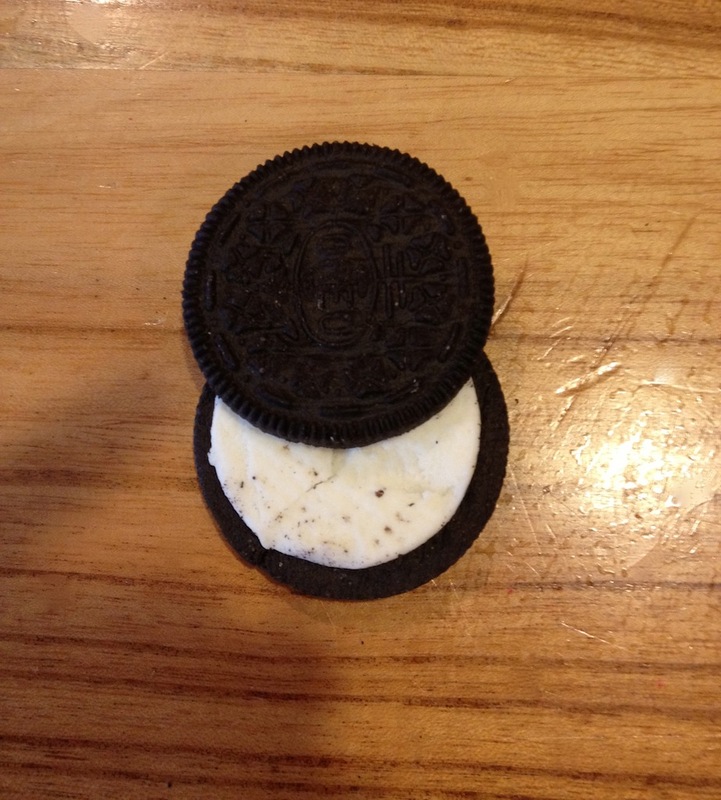 The Oreo cookie turned 100 years old today! At our house, that was something to celebrate. I bought a package of the cookies just for the occasion but had to hide them until today, you know, so I wouldn't eat them. 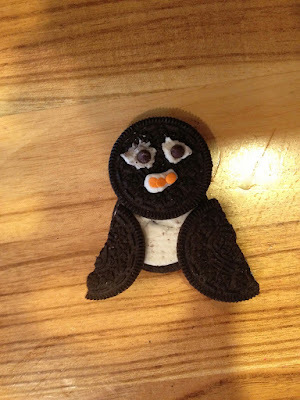 Here is a cute project I did with the kids after school in honor of OREO's special day. A "project" is the perfect excuse to use when mama needs some sugar. Since yet another snowstorm is on its way, I went with building "Oreo Penguins". 2. 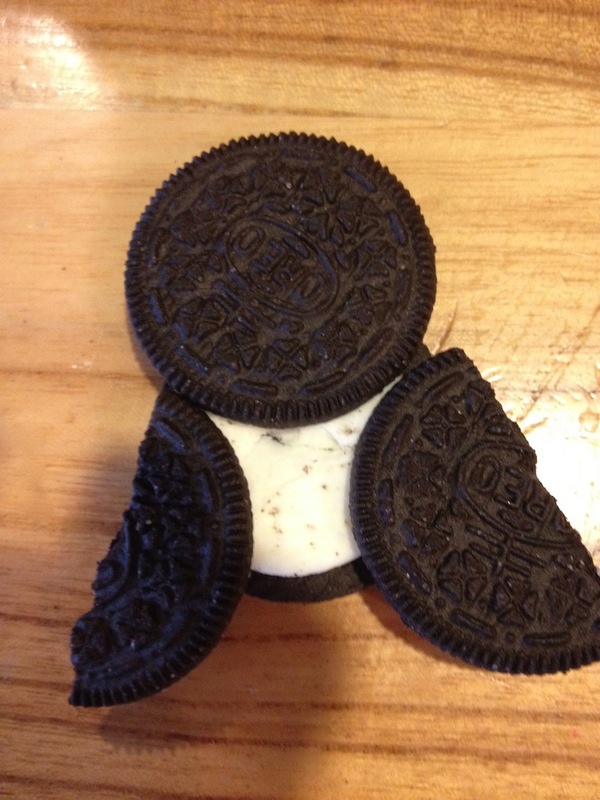 Carefully break the cookie open and slide the top up about halfway. Press softly. 4. 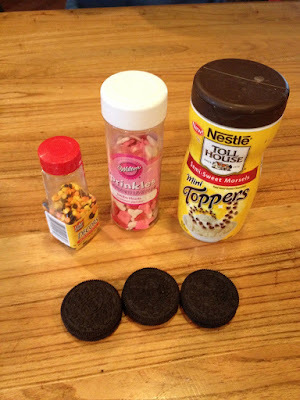 Use the filling from second cookie as your "glue." Take pieces of filling and use it to attach the penguin's eyes (chocolate chips). Then attach the beak and feet. Like I said, Candy Corn works great for this. We didn't have any, so we just used candy dots and candy hearts. Use whatever you have on hand..
5. When I showed the kids my penguin, the youngest said it looked like an owl :( Yep, save the kindness for someone else. After that, we made another and purposely made it into an owl. 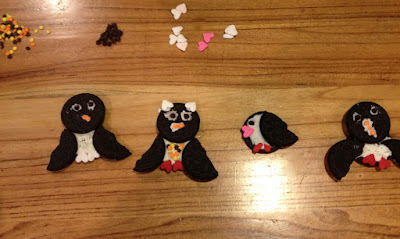 THAT turned into a flock of little birds..
Then, because it is MY family, the kids veered off-course into "one-upping" each other and created a few more species from the Animal Kingdom. It wasn't EXACTLY my plan. It never is. But I loved every second of having the kids together. I loved it SO much, I even shared the cookies with the kids. 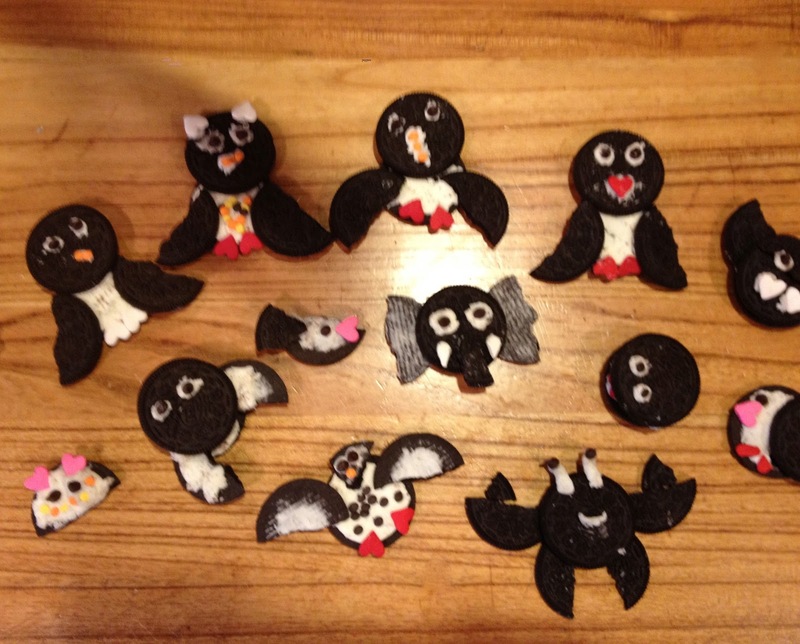 Okay, I shared the penguin with the kids. Thanks to Nabisco, for a fun Tuesday afternoon. Okay, hands down, this is my most favorite blog yet. 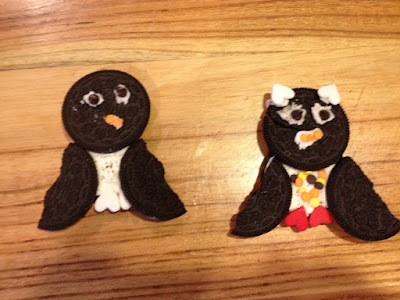 I love Oreos, I love oreos made into adorable animals and I love that the kids get to join in on the fun. I am so going to make these cute cookies ASAP. They will not last long in my house. You are so darn creative! Thanks to you, Anon! Oreo love runs deep at our house. Post pics of your new creations! Love it! I think around here we'd have to give out 4 cookies. You have to eat at least as many as you play with! Hil, I taught that saying to all of my Kindergarten students too! (it rhymes here as well). They would always say it whenever we passed out treats or crafts. I usually only had to say, "You get what you get.." and they would always finish the saying :) BTW, four cookies would definitely work here! Thanks for the smile! Hang on - is that all three of the kids sitting next to each other in the one picture? Wow, good job mom! Having been able to see all the creations first hand, I can say they were very impressive. The bonus was getting to eat a bunch of cookies later. I vote for more tasty craft projects like this in the future. Isn't candy corn's birthday coming up soon? Wait.. Hold on! Bottom picture, middle right.. Is that.. is that a bat? Phenomenal work! I mean, it's cut half-way (I'm certain not intentionally just because it wasn't made by the prime child). You've got a real Picasso on your hands, here. Funny how all of your kids are sitting.. Almost as if in order of their significance and/or talent? Hmm.. You've got your spectrum off just a little.. But regardless, Happy birthday oreo!